Carp fishing is fun, but can be frustrating at times. While the fish are extremely good at sucking up anything that seems foodworthy from the bottom of a river, they are also fussy eaters and will blow back out any bait that they consider suspicious. While you will often be lucky with baits such as dead worms threaded onto a hook, when it comes to man made baits, finding the correct type can be a challenge. Nothing beats the feelign though of a carp hooked up to your line, as they jump and fight their way loose, and you fight back hoping that the hook has set properly. Carp will also surface feed if you provide them with things like trout pellets, cat biscuits, frozen peas, bread and canned corn. These baits are cheap and effective, just attach them to a small size 6 hook and go fishing, most times bread proves the winning bait, especially for people new to carp fishing. For the pellets and biscuits, dip them quickly in some water before you leave home, then place them into a sealed plastic bag, after about an hour they will be soft enough to place on a hook. Always have a back-up bait such as bread, dough balls, or corn though, just incase the pellets / biscuits become too soggy. Soggy bait doesn’t go to waste however, just throw it in the region where your corn or bread is floating and it will sit in the water column, attracting not only carp but also perch, tench and trout! Once carp are interested in feeding you will often see them floating around the area of your bait, give them time to feel that the bait is safe to take from the surface, as they are quite fussy with surface baits and the slightest sign of a human nearby will have them swimming for their life, and unlikely to return. You will need to have some stealth about you, avoid sudden movements and wait until you are sure the bait has been taken before setting the hook. Another method can be to throw whatever you are using for bait into the water first, until you see them eating it from the surface, at that time, from a distance the carp can not see your movement, cast out the bait on a hook, the carp will often be in a feeding frenzy at this time, so will try to quickly snap up your bait before competition arrives. This method can be extremely enjoyable and fun, as you get to see every little bit of the action. 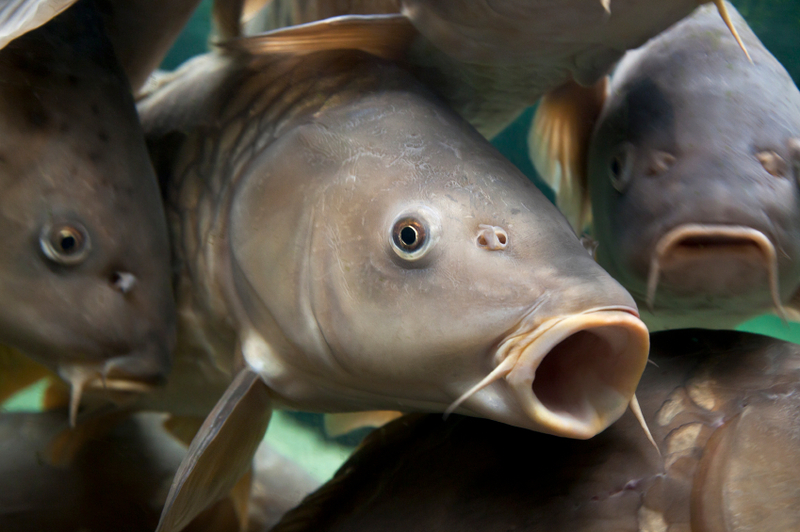 Carp will always taste food before they fully inhale it, if they don’t like the taste they will spit it out in fear and will not return. Large carp such as those found naturally in Europe are much heavier, and require a much heavier line to sustain them, most people prefer to use a 50lbs line with a smaller, 20lbs or so leader when targeting them in their natural range. Although tench are a little different to carp, most carp fishing techniques will work well with tench too, tench are great eating and far superior in taste to european carp. European carp (and european perch) love the taste of strawberry, if fishing with bread, dipping it in some strawberry essence mixed with water can add extra attraction to your bait. On all baits, you can use a 3 foot leader with a float attached if you need some extra distance. Otherwise dough balls are usually a good weight for casting a fair distance, they will float if you added yeast to the mix beforehand, or if you want a sinking bait just avoid using self-raising flour, or regular flour with added yeast or bi-carb soda. Keeping a good amount of bait as an attractant is the most professional way of catching carp, pre baiting a fishng spot for one or two days earlier at the time you plan fishing the third day can get the local fish in that area accustomed to when food is available, making the third days fishing much more productive. Remember to keep patient, avoid fast movements, and keep hidden from the carps line of sight for all to work out well!